By default, Guardian displays a standard block page whenever it blocks a web request by users. You can configure Guardian to display a specific block page when a web request is blocked based on unsuitable or objectionable content, location or time. 1. Go to Guardian > Block page > Policy wizard. 2. 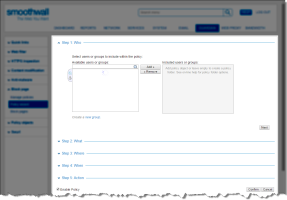 Step 1: Who — From the Available users or groups list, select who will see the block page when content is blocked. Click Next to continue. 3. Step 2: What — From the Available categories or category groups list, select what categories or category groups will trigger the content being blocked. Click Next to continue. For more information about categories, see Working with Category Group Objects . 4. Step 3: Where — From the Available locations list, select where the policy applies. Click Next to continue. 5. Step 4: When — From the Available time slots list, select when the policy applies. Click Next to continue. For information about time slots, see Working with Time Slot Objects. 6. Step 5: When — Select which block page to use. For information about the types of block pages you can use, see Managing Block Pages . 7. 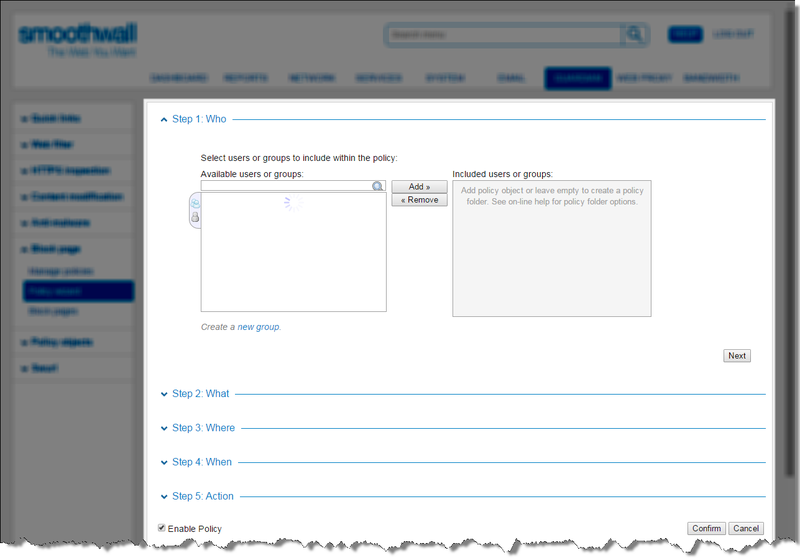 Select Enable policy to enable the policy and click Confirm. 8. Guardian displays the settings you have specified for the policy. Review the settings and then click Save to save the policy and make it available on the manage policies page.